Unfortunately for them, it is certainly not a physical place that gives content to our life and struggle; unfortunately for them, we’ll continue to be present in the city. A month ago we occupied an ex-municipal dog pound on Via San Nicola in Lecce, and transformed it into part living space and part a social place of struggle. For a few days some comedians of local politics (Northern League, Forza Italia, Sentire Civico, Movimento in Libertà) have repeatedly been demanding its eviction. Some more willing to talk big have also threatened to do it personally if the institutions don’t act quickly. But for the moment these have been words to the wind – how frightening!!! They have very few pretexts for demanding ‘restitution to the community’ of a building that had been abandoned for about a year, as it was considered unfit for the use it was destined to. In fact, in the attempt to put the ‘good citizens’ against us, they have no other excuse than denouncing ‘illegal’ use of the building and basic services, which are allegedly harming the citizens of Lecce. Not only do we believe that these buffoons don’t give a damn for those who live in Lecce, but they don’t even have any real interest in the Canaglia occupation. They are simply using this argument to ride the wave of hatred unleashed by their hero, the minister Salvini, and reuse it Lecce-style in the attempt to climb the ladder of local politics. For our part, we don’t have many words to dedicate to the brave avenger demanding enlightenment on the legality of our presence. 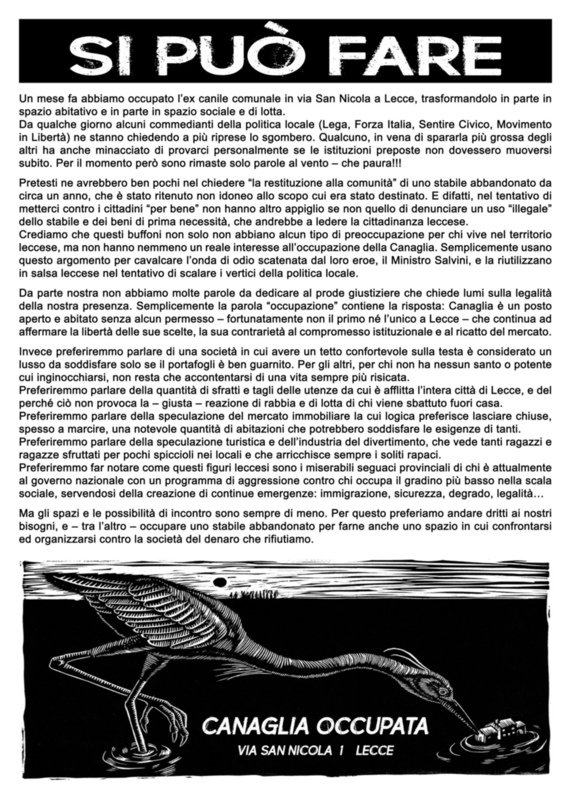 The word ‘occupation’ contains the answer quite simply: Canaglia is an open space inhabited without permission – happily it is not the first nor the only one in Lecce – which continues to affirm the freedom of its choices, its opposition to institutional compromise and to the racket of the market. Instead we’d rather talk about a society where to have a comfortable roof over one’s head is considered a luxury to be satisfied only if one’s wallet is well filled. For the others, those who have no saint or powerful to bow down to, there’s no choice other than to be content with an increasingly miserable life. We’d rather talk about the number of evictions and cuts of services being inflicted on the whole of the city of Lecce and about why this doesn’t cause the – right – reaction of anger and struggle in those who are kicked out of their homes. We’d rather talk about the speculation of the property market whose logic prefers to have a huge numbers of houses that could satisfy the needs of many closed down and left to rot. We’d rather talk about the speculation of the tourist and entertainment industry, which sees so many young people exploited for little money in entertainment venues and which always makes the usual rapacious ones rich. But the places and possibilities for meeting are becoming fewer and fewer. That is why we prefer to go straight to our needs and – among other things – occupy an abandoned building and turn it into a place in which to discuss and to organize ourselves against the society of money that we refuse. << Berlin: Liebig34 must stay!